Our sponsor Toilet Tree Products has offered us a great giveaway for a product that Pittsburgh Frugal Mom has just reviewed. 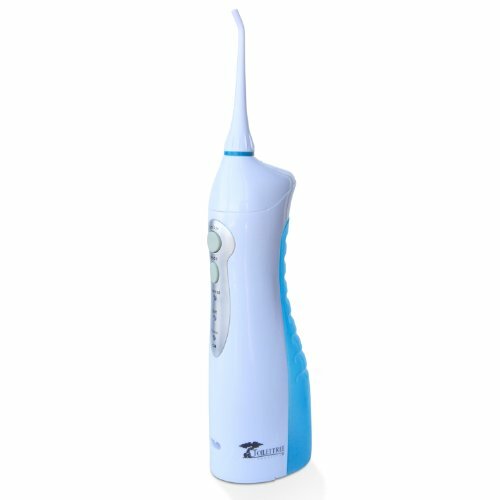 The product is a Toilet Tree Cordless Rechargeable Oral Irrigator. My best friend’s dad has been my dentist for years. I have great teeth, and great oral hygiene. Products like these keep my teeth and gums healthy, and are also great for kids. My son loves anything electronic, and will spend the time to brush his teeth if it is an electronic toothbrush. This would be a great way to get him to floss. This is also a great product for people with braces, retainers and other dental implants as it gets around those hard to reach spots. The Oral Irrigator is perfect, to clean your teeth each day and between meals. The set up is ingenious. The water tank on the Toilet Tree Cordless Rechargeable Oral Irrigator is actually on the irrigator, it is not separate. You will fill this unit up with water, place your pik of choice on the head and clean your teeth and gums. This is a rechargeable unit and it comes with a charging cord. I would not recommend this for anyone under 12, as the handheld base is too large for a child to control. This is great for adults and it is pretty compact for sink space. The Nozzle rotates in 360 degrees, and there are 3 operating modes, Pulse, Normal and Soft. The refill is right on the unit and takes seconds. This is a lightweight product, that will easily clean bridges and braces. The Professional Oral Irrigator comes with 2 nozzles. I love that I can walk about while I am using this because I can hang up towels and mini task. There are no cords to keep you contained to the unit or the wall and the idea the battery simply recharges is perfect! The cost of the equipment is well-priced and the thought of not hearing the dentist say you need to floss more or find a way to promote better gum care, PRICELESS! You can find this product and many other great products at Toiletree.com or on Amazon.com You can enter here for a chance to win one: Good Luck! This contest begins on 2/18 and ends on 2/25. The participating bloggers are not responsible for the delivery of this prize. This promotion is in no way sponsored, endorsed or administered by, or associated with, Facebook. We hereby release Facebook of any liability. «Closed: iPad2 Giveaway with Mom Powered Media!